White Oil Market size valued at USD 5 billion in 2017 and will witness CAGR of over 2.5% from 2018 to 2024. 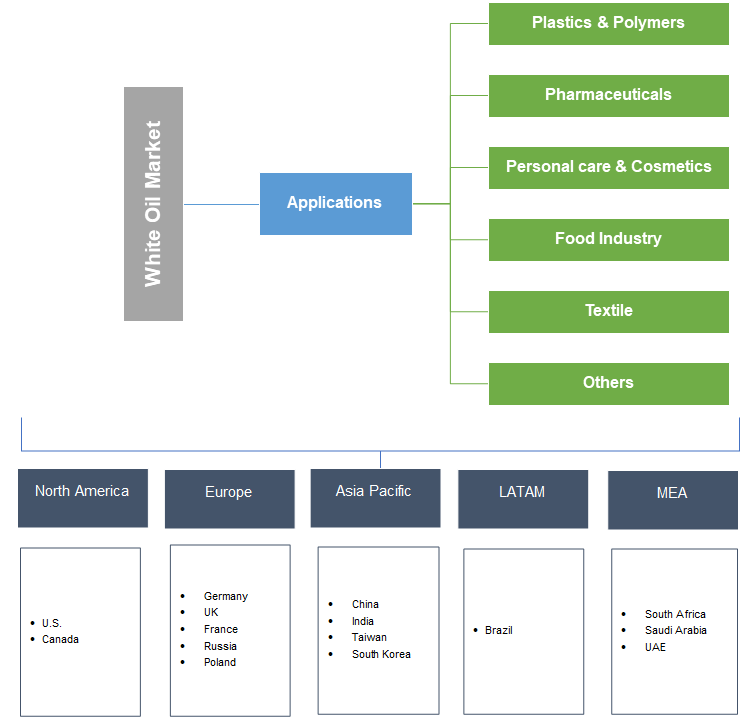 Increasing application scope in the numerous industries including personal care, pharmaceutical and textile industry is expected to fuel the white oil market growth. Benefits such as exceptional skin compatibility, low irritancy, low environmental impact, and resistance to bacteria and other unwanted elements makes the ingredient essential for personal care applications. Cosmetic industry growth owing to the increasing focus on skin care and nourishing products for hair styling, coloring products, and suntan products fostering the industry share. White oil has become an essential ingredient in varied applications including cosmetics and personal care. Surging demand for sunscreens, body lotion, cleansers, emollient and makeup products with long durability moisturizing benefits will boost the white oil demand. Also, infant skin care products including lotions and emollients will propel the white oil market outlook. The implementation of innovative technologies and increase in the adoption of group II base oil by various manufacturers has positively impacted the global white oil market share. Lubrication professionals widely use them as both synthetic and mineral-based lubricants in their plants. The product also has application in the processing of elastomers and specialty adhesives owing to their moisture and water resistance properties. Extensive usage in the processing of the polystyrene, thermoplastic elastomers and polyolefins, due to its excellent chemically stable advantages will benefit the market growth. This mineral lubricant controls the melt flow behavior of several finished products with the help of its natural release properties. Moreover, white oil products are drawing the massive attention from the several manufacturing companies on account of its versatile features including odorless, colorless, and biological stable benefits. Technological advancement continuously improvising the characteristics of white oil, providing new opportunities for the numerous applications in various industries. The ingredient act as a mold release, wetting agents and resin catalyst carriers for numerous applications supporting market growth. However, factor such as excessive costs with respect to the preparation of personal care products, absence of high-quality crude lubricant, price volatility, and uncertainty in prices may restrain the white oil market growth. Food industry accounted for 5% of the industry share in 2017. The industry is expected to witness significant gains as they are widely used for dust suppression, and dough divider in the food processing. Growing demand for sugar refining & coating on eggs, food packaging materials, and fruits & vegetables have encouraged white oil product upgradation in terms of grades as per applications. Furthermore, widespread usage in food-grade lubes, release agents, and wrapping paper materials will drive the white oil market demand. Plastics & polymer application generated more than USD 750 million revenue in 2017. Rising demand for the PVC lubricants, thermoplastic rubber, and elastomers will fuel white oil market share. Improved innovations owing to the continuous advancement in the new materials and process to cater the global demand boosting the industry share. These innovations are enabling new applications for the polymer manufacturers, extruder and molder are incorporating versatile products into their resin formulation, lubricants, plasticizers strong generating revenue share. Personal & cosmetic market is anticipated to observe more than 3% CAGR from 2018 to 2024. High consumer preferences for the baby lotions, bath baby emollient, and creams are strongly supporting factors for the product advancement. Moreover, the growing demand for white oil in water-resistant creams due to its excellent moisture barrier benefits is likely to boost the market development. Shifting consumer preference in daily personal care products which are pure, durable, and consistent has enhanced the white oil market growth. Pharmaceutical application was worth more than USD 1 billion in 2017. Industry growth is primarily driven by rising white oil applications as a lubricant in the medical machinery and instruments, as a base constituent. Major companies are constantly increasing production capacity for manufacturing medicines, tablets, syrups, ointments and other products are expected to boost industry share. The healthcare industry has increased product diversification and continuous developments in the technology, and processes will fuel global white oil market demand. 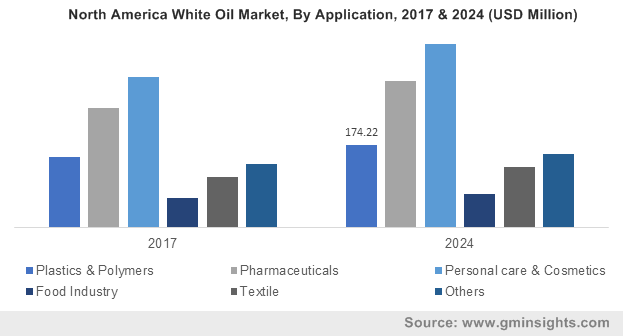 North America white oil market is projected to witness around 2.5% CAGR from 2018 to 2024 due to the presence of leading companies in the region, including ExxonMobil Fuels & Lubricants, Sonneborn, and Chevron Corporation. As these companies continuously focus on product enhancement to gain competitive advantage, they will positively stimulate the overall market projection. Additionally, the increasing demand for protective diluents, moisturizers, emollients, hair care, and baby care products will propel the product demand. Asia Pacific white oil market generated over USD 2.5 billion revenue share in 2017. This is mainly credited to the polymer and textile and personal care industry expansion. In 2016, China and India exported textiles worth over USD 280 billion and USD 45 billion, respectively. The prevalence of disease and change in demographic trends in Asia Pacific is anticipated to drive the pharmaceuticals market in India and China. Favorable regulations and administrative initiatives; for instance, Pharma Vision 2020 in India for the development of pharmaceutical & drug sector will positively impact the revenue growth in this region. The white oil market share is fragmented in nature owing to the several industry participant presences in the market. Major players are Sonneborn, Exxon Mobil, Renkert, Petro Canada, and Sinopec Corporation. The companies are adopting strategic merger and acquisition, and portfolio expansion is adopted by the companies. The manufacturing companies changing distribution levels consisting of dealers and wholesalers with the changing consumer base. The other notable players are Chevron, BP, Royal Dutch Shell, Sasol, Seojin Chemical, and JX Nippon & Energy Corporation serving in the market. The third-party distribution involves wholesalers and dealers elongate the distribution chain and increase sales & distribution across the region. White oil is a mineral lubricant used as a blending base for the pharmaceutical and cosmetic products. Increasing demand for the product applications such as personal care cream, lotions, and laxatives has improved product utilization in the market. These products are generally recognized as a highly refined grade specially produced from base lubricants consisting of saturated paraffinic and cycloparaffin hydrocarbons. The refinement process, ensuring the complete removal of the Aromatics, Nitrogen and Sulfur compound. The ingredients has industrial usage in the polystyrene manufacturing, food packaging and processing of machinery & equipment.